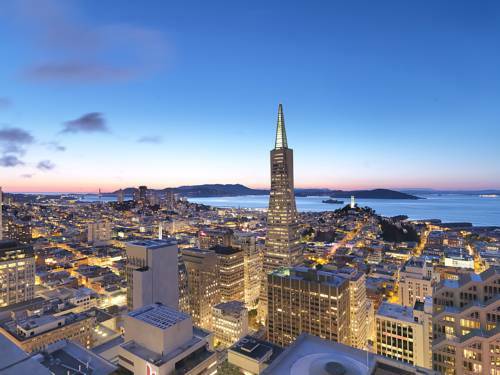 Loews Hotels is proud to be part of the San Francisco neighborhood. Opened on April 15 2015 the Loews Regency San Francisco Hotel is located on the top 11 floors of the California Center Tower. The hotel offers luxurious rooms and suites with un-paralleled views of the city and the Golden Gate Bridge. Combined with a full-service restaurant 24-hour room service meeting space a spa and fitness center and top notch guest service the hotel is ready to offer guests the room they need. Brasserie S and P: Named for our location at Sansome and Pine Streets the restaurant presents an approachable modern menu inspired by locally grown ingredients. Enjoy an intimate setting and attentive service as you enjoy fresh dishes. Located on the top 11 floors of San Franciscos third tallest building the Loews Regency San Francisco offers stunning city and Golden Gate Bridge views.